“Think occasionally of the suffering,” writes Albert Schweitzer, “of which you spare yourself the sight.” Which suffering, the good missionary doctor might have added, is easy to ignore for you of the borderless city, whose centre is everywhere, whose periphery is nowhere. Because in the mind of the city nowhere is the place of the wretched of the earth, they the ones who live on, by, and for the land, little peripheries of land no longer theirs but now completely the city’s – and that simply by naked right of money – as if we were not, every mother’s son (or daughter) of us, a child of Eve.
. . . 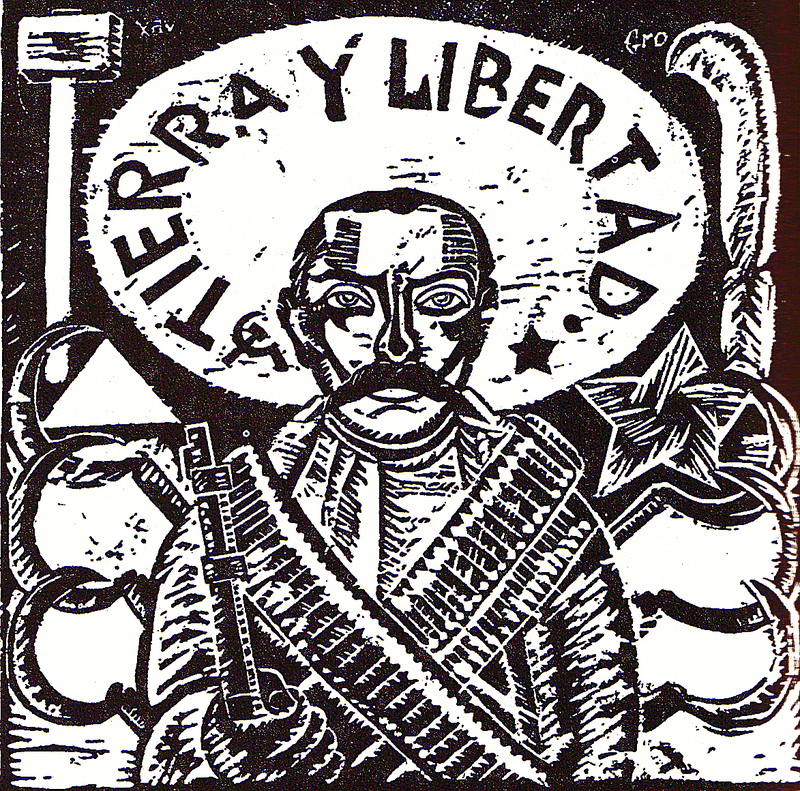 It was no accident that the great slogan of the Mexican Revolution (equivalent to “liberty, equality and fraternity” in the French Revolution) was Tierra y Libertad – land and liberty. 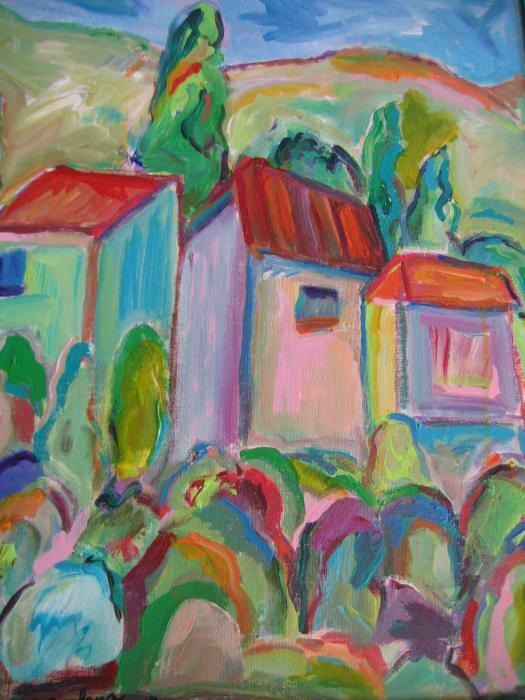 The core problem of the Diaz years was the way the hacienda had encroached on village lands. Most villages had enjoyed their communal lands for centuries through customary right and had not filed documentary title to the territories in Mexico City. The hacendados and their lawyers took advantage of this to assert ownership in the village lands and water. 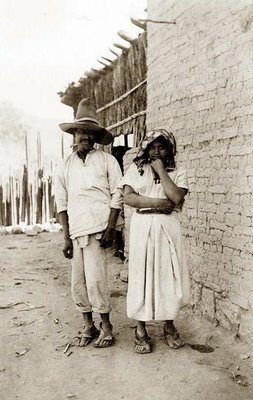 By 1910 half of the rural population of Mexico had been reduced to dependency on the hacienda and many villages were hacienda pueblos. Even where the villages were not in hacienda territory, their inhabitants were often landless and had to work in the haciendas. The free non-hacienda villages were largely Indian and these were squeezed mercilessly until only a few retained their own ancient lands. Peaceful resistance was all but impossible, since the hacendados controlled the state courts and dominated local politics, making local democracy or free elections impossible. The villagers could in a sense count themselves lucky, for there was an even more exploited group of people: the peons who lived and worked permanently on the hacienda grounds, as opposed to the villagers who worked as day laborers. These peons were ground into the dirt by the nefarious system of debt peonage, common in the south, which made the states of Veracruz, Campeche, Chiapas and Yucatán the closest thing to the notorious serfdom of Russia and eastern Europe. The peon, indentured to the hacienda and unable to leave, toiling all day under the sun, at the mercy of brutal overseers and harsh discipline enforced by whips and riding crops, and perforce to buy all his needs at the company store, where debts were run up either honestly or dishonestly. When these debts were made heritable, so that the children inherited their parents’ debt, peonage became slavery in all but name. Echoing the cynical transactions in Gogol’s Dead Souls, owners bought and sold each other’s peons and used bounty hunters to track down fugitives, who would then be beaten to death as a bloody warning to the others. It is difficult to overstate the cynical savagery of debt peonage. Many peons owed up to three years’ wages in debt which could never be repaid, especially as their employers cynically fiddled the figures. One company storekeeper was reputed to add the date at the top of the page to each peon’s debt. The hacendados liked to keep their charges in ignorance, and on many haciendas schoolteachers were expressly forbidden to teach arithmetic to the permanent workers. Since Spaniards often held positions on the hacienda as keepers of the company store, clerks, foremen or managers, the gachupines were particularly hated, and Spain was always the main target for xenophobia in Mexico. 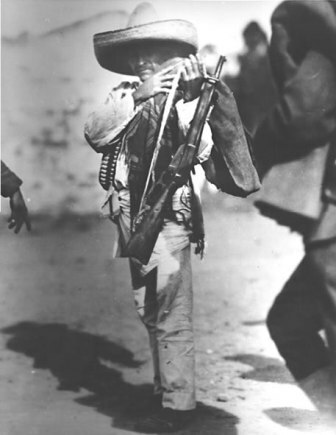 The threat to all villagers was clear: if they lost their lands to the haciendas or became economically unviable, they would face starvation unless they became permanent employees on the haciendas and thus got sucked into the maw of debt peonage. 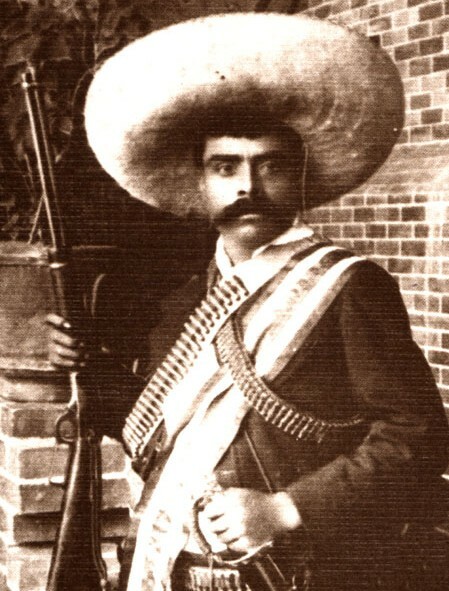 Although the state of Morelos did not suffer from the worst excesses of the hacienda system farther south, the mind of Emilano Zapata cannot be understood without appreciating the role of land in his mentality: both this mystical feeling for the soil of his ancestors, and his negative appreciation of what lay in store for the villagers of his state if they did not resist the big hacendados. Zapata’s men came not as conquerors or marauders but as awe-struck sightseers, gaping at the unusual features of the city. 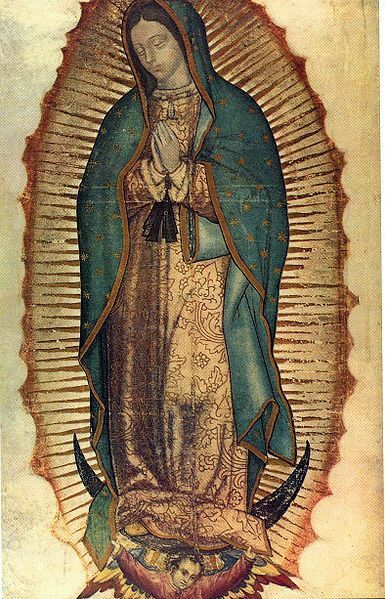 They were peaceful, deferential, simple folk, the classic country cousins up for the day in the big city, naively carrying banners of the Virgin of Guadalupe and displaying their rustic origins by their coarse white cotton clothes, Franciscan sandals and big straw hats. They wandered the streets like lost children, begging and panhandling for coins from passers-by, knocking on doors and politely asking if they could have some food. 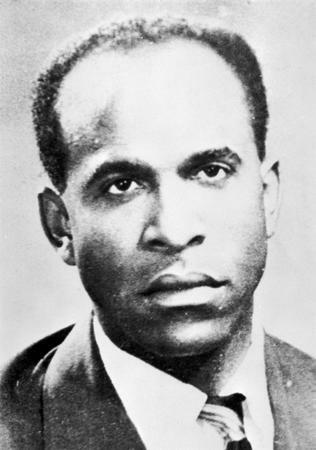 A terrified flaneur was approached by a group of Zapatistas wielding machetes who, he was convinced, wanted to kill him. However, they took off their huge sombreros, threaded them circularly through their fingers, and said in humble voices: ‘Young master, could you let us have a little money?’ The most famous story is that the Zapatistas opened fire on a clanging fire-engine speeding to an emergency, thinking it a kind of primitive tank, and killed twelve firemen. To the amazement of Mexico City’s bourgeoisie, there were no expropriations, except of houses belonging to Morelos planters. 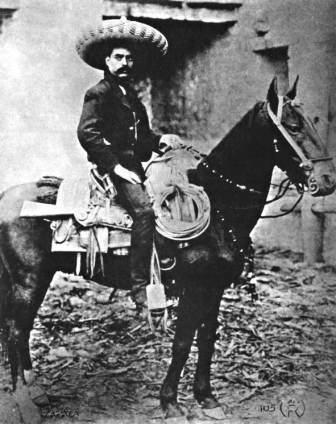 It was not long before the middle classes were pointing to the absence of speeches, proscriptions and confiscations, praising Zapata to the skies and contrasting him with the predatory and aggressive Carranza and Obregón. Where [Pancho] Villa and his chiefs always made straight for the most luxurious houses once they occupied a city, Zapata displayed a Cato-like asceticism by staying in a dingy third-class hotel a block away from the railway depot. He left city administration to his underlings and delegated to his brother Eufemio the task of showing provisional president Eulalio Gutiérrez around the presidential palace. The man who four years earlier was an obscure village leader in Morelos was now master of Mexico City. To the oft-whispered question by an anxious urban bourgeouisie – ‘what does he want?’ – there was only one answer: nothing. Zapata always hated the national capital and could hardly wait to return to Morelos, but there was more than caprice or personal predilection involved here. 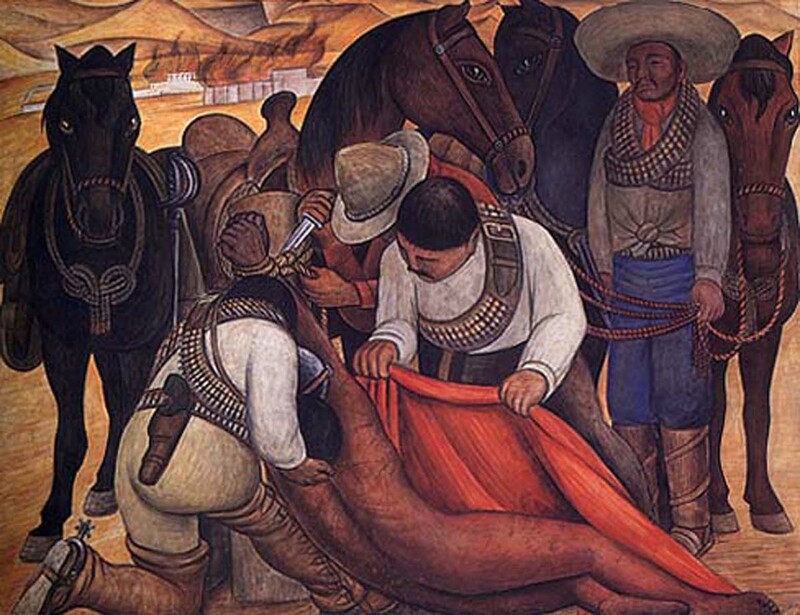 A dislike of cities was imbricated in the entire Zapatista ideology, for cities represented the power of the state and its full-time officials, the ultimate anathema for all attracted by aspirations, but it was never so in the Leninist sense of aiming to capture the apparatus of the state and imposing a national ideology. The peasants of Morelos, with their banners of the Virgin of Guadalupe . . . 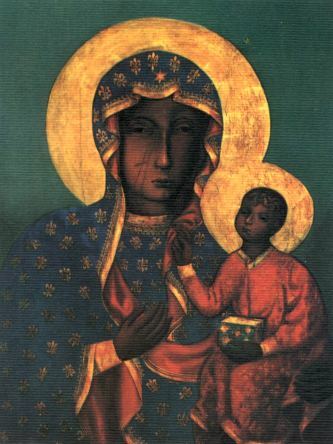 The Mother – a golden age far, far in the past, yet the Zapatistas would resurrect its memory in a twentieth century revolution under banners of the Virgin of Guadalupe. 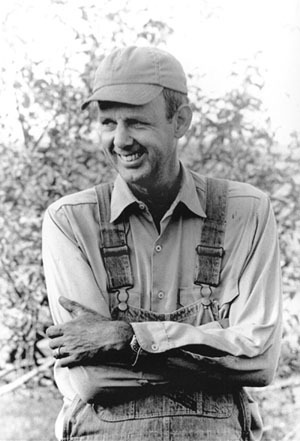 “Whether we and our politicians know it or not,” says Wendell Berry as part of an endorsement statement for The Dying of the Trees (1997) by Charles E. Little, “Nature is party to all our deals and decisions, and she has more votes, a longer memory, and a sterner sense of justice than we do.” And so who is to say that Zapata did not know far more than any politician of his time about what human beings truly needed, about what truly needed to be done? “If you don’t know where you’re from,” Berry reminds us, “you’ll have a hard time saying where you’re going.” Even though revolution never has been and never will be the answer, just as suppression, imprisonment, and execution never have been and never will be the answer, Zapata and the Zapatistas, far more clearly than your typical city-dweller, knew nonetheless where we are from, just as they had a clearer vision, under the banner of the Virgin, as to where we ought to be going. “Without you, without your onslaughts, without your uprootings of us,” writes Pierre Teilhard de Chardin (whose anniversary of death is also this day, April 10) in the Hymn of the Universe, “we should remain all our lives inert, stagnant, puerile, ignorant both of ourselves and of God. You who batter us and then dress our wounds, you who resist us and yield to us, you who wreck and build, you who shackle and liberate, the sap of our souls, the hand of God, the flesh of Christ: it is you, matter, that I bless.” Matter, the Mother: forget where we are from, and how can we not help but forget where we ought to be going? 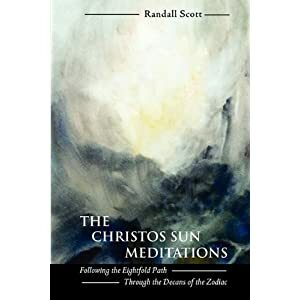 “The time has come to realize,” writes Teilhard de Chardin in The Phenomenon of Man, “that an interpretation of the universe – even a positivist one – remains unsatisfying unless it covers the interior as well as the exterior of things; mind as well as matter. 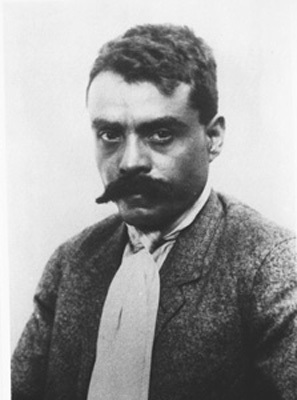 The true physics is that which will, one day, achieve the inclusion of man in his wholeness in a coherent picture of the world.” And this Zapata and the Zapatistas also knew very well, their picture of the world as coherent as that of any contemporary physicist and far more inclusive. For did not the Holy Virgin in her seven sorrows give her Divine Son over to men to be mocked and scourged and nailed to the Cross? 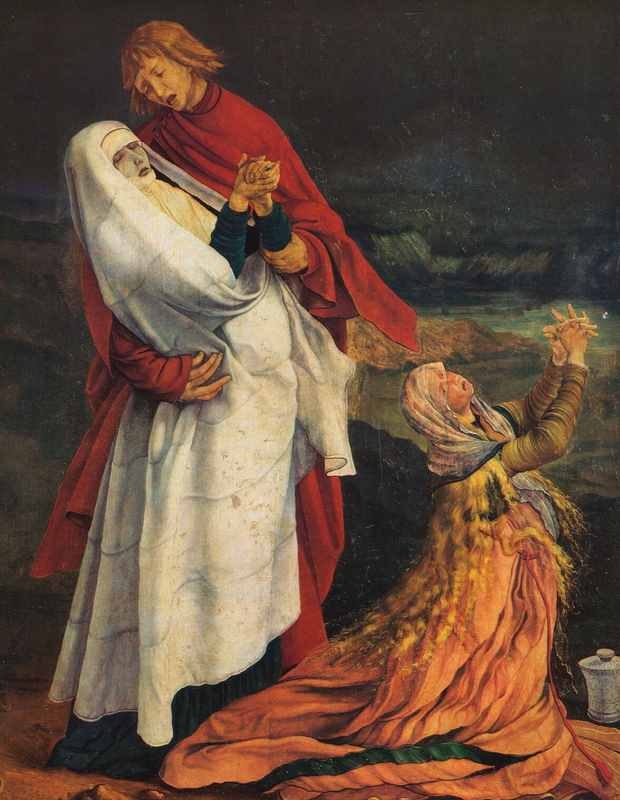 Did she not in her last sorrow stand at the foot of the Cross? 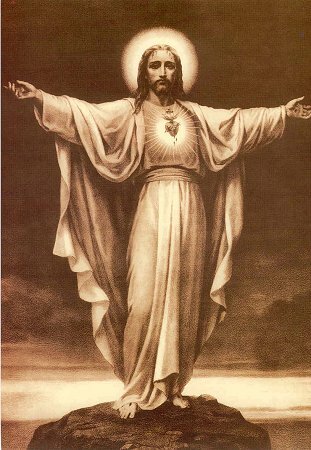 And did not the Crucified One, dead and buried, rise from the Earth on the third day as the First Born of the Dead? And did He not say He would return again one day in the clouds in great glory, bringing with Him a new Heaven and a new Earth? “In the final analysis,” Teilhard de Chardin reflects, “the questions of why bad things happen to good people transmutes itself into some very different questions, no longer asking why something happened, but asking how we will respond, what we intend to do now that it happened?” Whether or not the wretched of the earth are “good” people, who will dare claim that, as a whole, that they are somehow worse than those who take their land away or than those who directly or indirectly sponsor the theft? Who will claim that they are somehow worse than politicians and somehow worse than the bankers and investors that control politicians? Of course over and over again what the wretched of the earth intend to do when their land has been stolen is somehow to take it back, which effort, in the case of the dark-skinned Zapatistas, was undertaken in the Mexican Revolution under the banner of the appropriately dark-skinned Virgin of Guadalupe. She died April 10, 1835, and she was canonized in 1988. Seeing the crucified Christ in the poor, the sick and the suffering: “All the world is full of suffering,” writes Helen Keller. “It is also full of overcoming.” And surely the overcoming we accomplish is not only for ourselves, it is not only for humankind, but it is also for the Earth, who is our Mother, “the mother who nourishes us and cares for us”, the Mother of everything living. “We are one, after all, you and I,” Pierre Teilhard de Chardin reminds us. “Together we suffer, together exist, and forever will recreate each other.” Accordingly, in that sense, are we not all of us, rich and poor, are we not all of us, every mother’s son (and daughter) of us — sinners that we are — the wretched of the earth, of Mother Earth, of Her who waits with eager longing for the revealing of the Sons and Daughters of Light? Thanks for this post, many thanks.